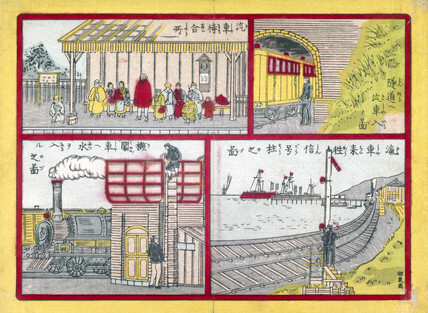 Clockwise from top left: pasengers waiting on a platform; a train entering a tunnel; a signalman manually operating his signal on a track that runs parallel to the seashore, with a pier and large ships in the distance; a locomotive taking in water. Railways were constructed in Japan from 1854, first under foreign direction, but from the 1880s with little foreign help. Woodblock prints like this one introduced modern western technology to the Japanese public.